Mexico City, the Capital of Mexico and one of the biggest cities of the world is a MUST when you visit Mexico. There is no other place in this country with so much history, great architecture, the best food of the country and so much choice for Nightlife. 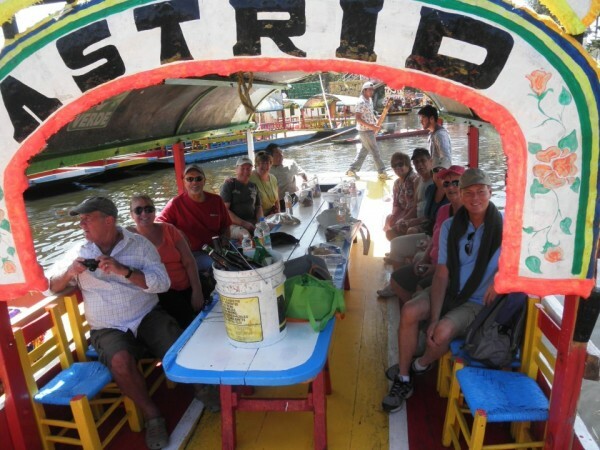 During this tour, you will visit with a Superior Private Guide all highlights of the City. See the Historic District, the floating Gardens of Xochimilco, the Frida Kahlo Museum, and of course, the Pyramids of Teotihuacan. 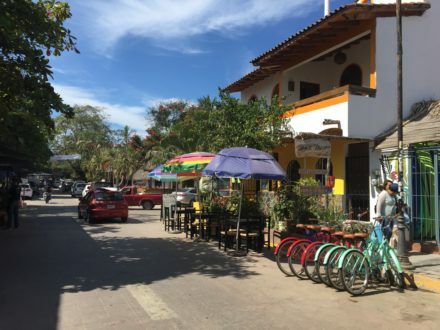 Our hotel, Plaza Florencia (or similar) is located in the Zona Rosa; famous for its many restaurants, bars and clubs. No time to get bored during this tour!! Arrival in Mexico City, transfer to hotel in Zona Rosa. 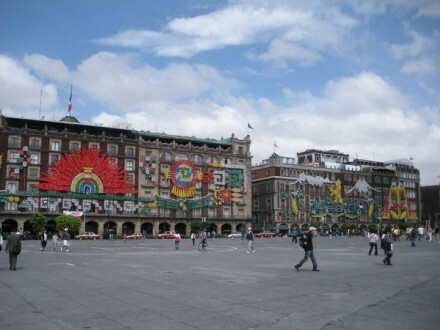 See the City from the Torre Latino Americana, visit the National Palace, see murals by Diego Rivera. The most important church of Mexico City; the Basilica of Guadalupe and the City of the Gods. Casa Azul where Frida grew up…..now a museum! Depending on the time of your flight back you most likely will have time to stroll around in the Zona Rosa/La Condesa. please note that these rates are with a minimum of 4 people (two double rooms). In case you are less than 4 people we have to make another calculation and the final rates depend on the activities that you would like to do. We customize any tour! 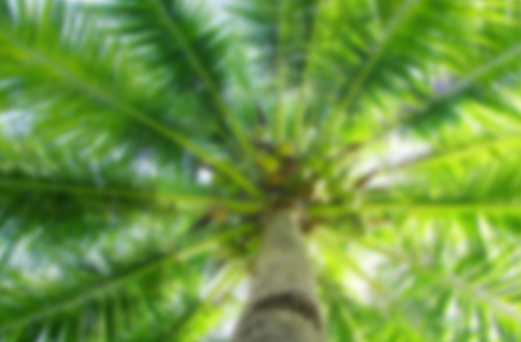 Our individual packages are available in English, Spanish, Dutch and French. Mexico City, the Capital of Mexico and one of the biggest cities of the world is a MUST when you visit Mexico. There is no other place in this country with so much history, great architecture, the best food of the country and so much choice for Nightlife. During this tour, you will visit with a Superior Guide all highlights of the City. See the Historic District, the floating Gardens of Xochimilco, the Frida Kahlo Museum, and of course, the Pyramids of Teotihuacan. Our hotel, Plaza Florencia (or similar) is located in the Zona Rosa; famous for its many restaurants, bars and clubs. No time to get bored during this tour! Arrival in Mexico City. Please take a taxi to the hotel. We suggest to stay in the Plaza Florencia hotel for the excellent location. This is a 4 star hotel in the heart of the Zona Rosa. In case you prefer to stay in another hotel we can arrange this too of course! Our guide wll pick you up at the hotel, and we will start our guided city tour. We will see the City from the Torre Latino Americana, 44 floors high. 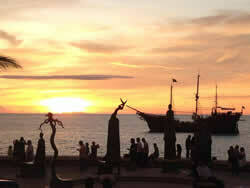 After that we will take you to the National Palace with the famous Murals by Diego Rivera. In ancient times, Mexico City was called Tenochtitlan. An estimated 250.000 Aztecs used to live here, by that time already the biggest city of the world. The remains can be seen at the Templo Mayor, next to the Zocalo, the main square. Of course a visit to the Cathedral should not be missed. In the afternoon we visit the Museum of Anthropology and History. We will show you all highlights of this unique museum. The museum is open to public since 1966 and basically all treasures that have been found in archaeological sites have been brought there. This is the new house for the Aztec Calender. 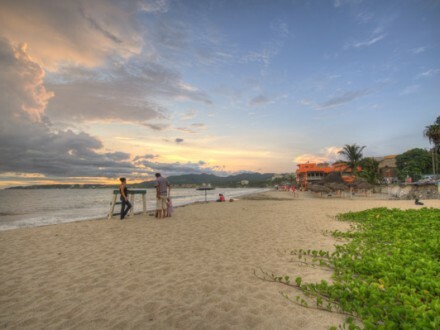 There could not be a better place to get to know the complete history of Mexico. After breakfast we will leave the hotel at 8.30 am to show you the most important church of Mexico City; the Basilica of Guadalupe. “Guadalupe” is the patron Saint of Mexico. She is visited by millions of Mexicans every year. Our next stop is Teotihuacan, where you can climb the pyramids. Teotihuacan was constructed between 200 BC and 700AC by an unknown tribe that we later called the Teotihuacanos. The Aztecs adopted the name, “The City of Gods”. The temple of Quetzalcoatl, the pyramid of the Sun and the temple of Quetzalpapálotl are just a few examples of what you can expect to see there. Bring good walking shoes! In the afternoon we will bring you to a demonstration of how the indigenous people used to work obsidian, a volcanic stone, far more precious than gold for ancient tribes in Mexico. We will be back around 4.30pm in your hotel, so that you have some time to do things on your own. Our first stop of the day is the Frida Kahlo museum. 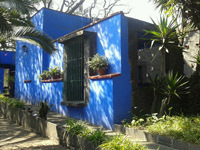 The “Casa Azul” used to be the house where Frida grew up. Now it is a museum. 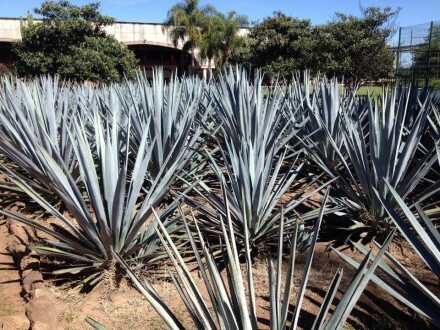 You can see original paintings from her ánd Diego Rivera in this colorful museum. After this tour you have some free time to see Coyoacan. This is a wonderful place to visit, especially on a Sunday! 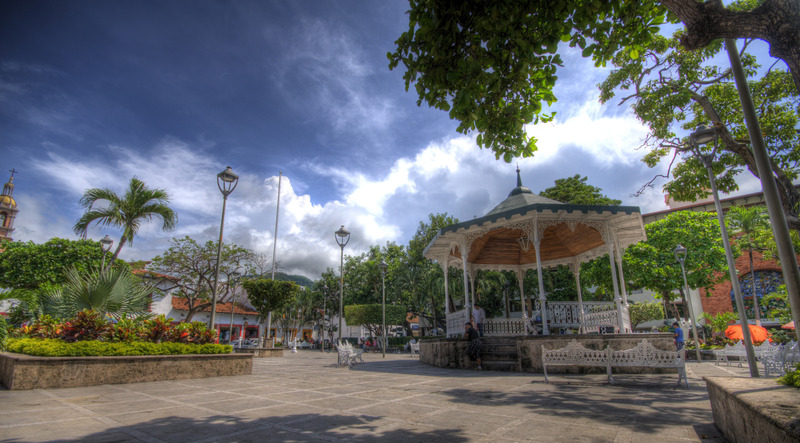 The main plaza is one of the liveliest of the whole country. Later in the afternoon we will head to Xochimilco. This place is one of the most colorful places that you can see in Mexico. Here we will make a boat trip along the “floating” gardens, while we listen to the Mariachi musicians. At night you can take an optional tour to the Famous Ballet of Amalia Hernandez in the Bellas Artes Teatre. Depending on the time of your flight back you most likely will have time to stroll around in the Zona Rosa/La Condesa, do some shopping in the moderns malls or markets of Mexico City. We will give you plenty of suggestions. If you fly with the group we will transfer you to the hotel. In case you fly back late at night you can store your luggage in the hotel. Also, you can extend your stay for a supplemental charge so that you can take for example a day tour to Puebla, the city of Angels or Taxco Silvercity.